Shows like BoJack Horseman, GLOW and Unbreakable Kimmy Schmidt are taking a bold, complex approach to tackling systemic misogyny. It wasn’t necessarily to be expected that the most potent responses to the Harvey Weinstein scandal and #MeToo movement would come from the world of television, much less sitcoms – but in 2018, three Netflix comedies have led the way in addressing themes of sexual violence, gender disparity, and male toxicity. BoJack Horseman has had the most to offer so far, giving its latest season over almost wholesale to the issue, while Unbreakable Kimmy Schmidt and GLOW have also shown that television offers the best format for tackling systemic misogyny. In Kimmy Schmidt and GLOW, the storylines implicating abusive men came at a quite brilliant tangent, being more of a subplot than an overarching storyline. This is important, because by slotting these stories into pre-existing universes, the shows are able to highlight how a patriarchal culture of abuse lies behind everything, is simply part of the scenery. In a remarkable episode of GLOW apparently written before the Weinstein story even broke, Ruth Wilder (Alison Brie), the principal wrestler in the female wrestling troupe, is summoned to dinner with the head of the TV network hosting their show. Ruth attends in the company of a male agent, who subsequently makes himself scarce, leaving her to the attentions and mercy of the lubricious exec, in an exact mirroring of Weinstein’s preferred scenario for intimidating and sexually abusing actresses. Ruth flees the scene at the first opportunity, but then finds her show relegated to a graveyard slot. More pertinently still, when she reveals her ordeal to a fellow (female) cast member, she is met not with sympathy but with derision: Debbie Eagan (Betty Gilpin), her rival on the show, clearly sees male abuse as something to be dealt with, and is furious at her career being jeopardised. BoJack Horseman enacts a similar scenario, several times over, showing several women who are not especially alarmed or disgusted by male predation, but rather resigned to it and ready to work with it as best they can. 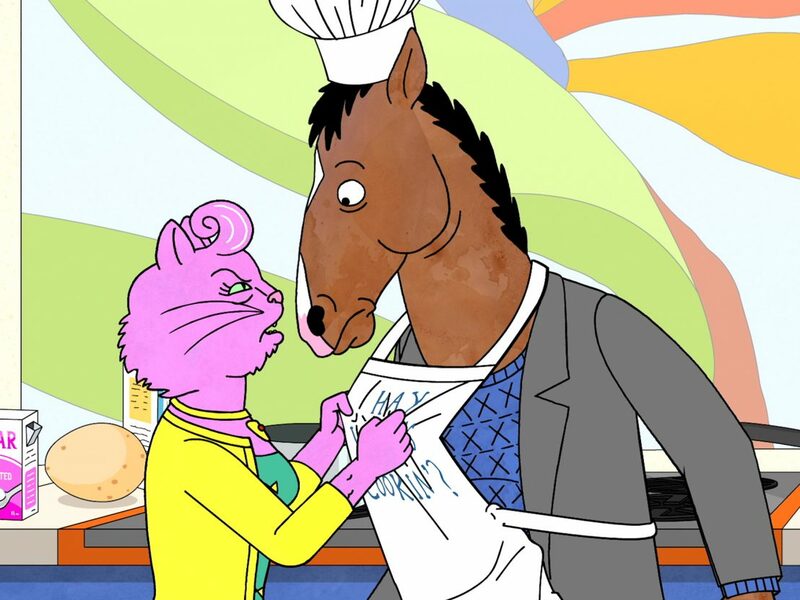 In ‘BoJack the Feminist’, Princess Carolyn is the producer who knows she has employed a disgraced actor – one Vance Waggoner, who is figured as a meshing of Mel Gibson and Alec Baldwin – but has to work with the system. Angela Bassett voices another agent who is similarly determined to have a successful career by working with someone she privately condemns. Towards the end of the show, Gina – one of two new female characters in season five – swallows her pride after being choked by BoJack in a drug-addled fit, because she wishes to continue her career rather than see it derailed by a man. These conclusions are desperately bleak, but they are necessary and realistic, giving a sense of the ambiguities of money, personal ties and professional connections. Kimmy Schmidt does feature a confrontation – such as never really materialises in BoJack Horseman – with someone called Fran Dodd, who works as a stinging parody of aggrieved Reddit-dwelling men’s rights activists. But the confrontation, in which Kimmy finally defeats Fran in an elbow-wrestling contest, makes clear that his ilk can be called out but perhaps never defeated. More sickeningly, even though the show couches this in dark humour, Fran is a defender of Jon Hamm’s convicted abuser. Again, this aspect remains a mere facet of the show, presenting the violent idiocy of his arguments as a backdrop to the principal action. Kimmy Schmidt, like BoJack Horseman and GLOW, is well placed to discuss this sexism because of the invaluable groundwork it laid in earlier seasons, particularly in its treatment of male abuse. 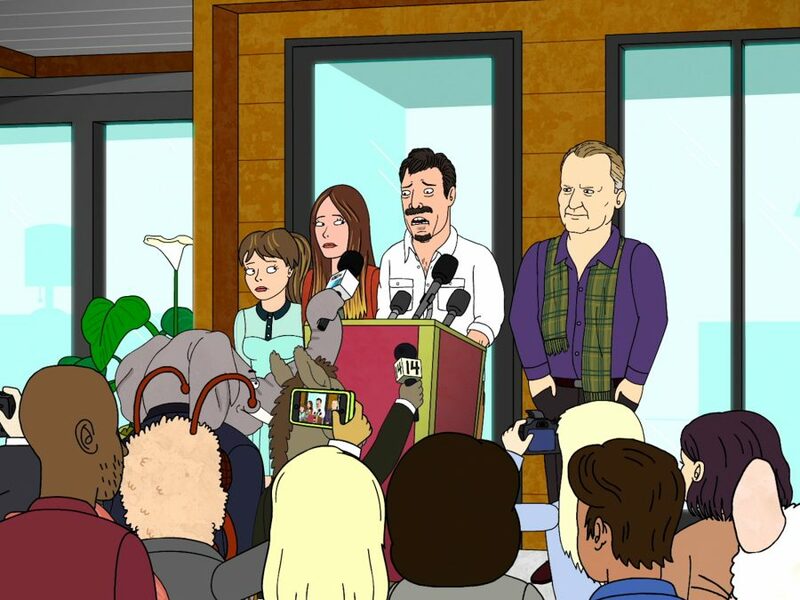 BoJack Horseman has been laying this groundwork for four seasons now, in its acidic depiction of Hollywood and its treatment of a rich actor who destroys everyone around him. 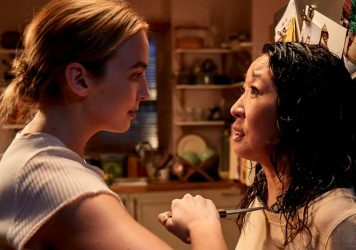 The show is able to deal with the topic of male toxicity precisely because it is in the midst of wrestling – in an almost unbearably raw way – with its own legacy and culpability. It’s clearly a matter of some disgust to Raphael Bob-Waksberg, the show’s creator, that his anti-hero is beloved of fanboys, rather than seen as damaged and poisonous. To see him and his writers attempt to tear this down by tuning up the characters’ evils and giving the programme an actively more female voice, is to witness the very act of reckoning that we so need from male actors and creators in Hollywood. 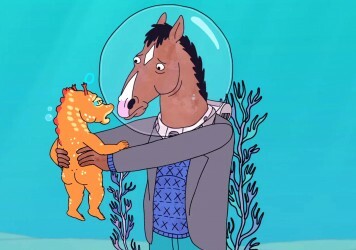 BoJack Horseman’s brilliance lies in recognising that an abuser might be not just an evil, heartless person, but an everybody – a relatively good guy who wants to change. In allowing its main character to embody these questions, and not just the ordure that is Vance Waggoner, the show breaks new ground. These responses had to come from television, because they needed to take place in a recognisable and intricately built world. They needed to come from comedies, too, because in a drama these storylines would have to occupy the totality of a drama, rather than weave in and out of the storyline, as so much background noise. Cinema may still provide full and robust dramatisations of or responses to the important issues, but for a complex look at #MeToo, it’s shows like these that we need to look.